This is the first of what will be an annual event, comprised of a week of community workshops on writing, storytelling, independent publishing, and bookmaking; panel discussions; and storytelling events. 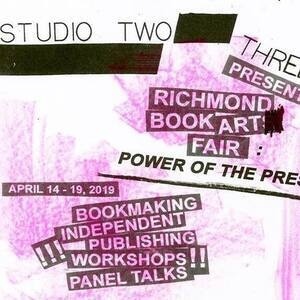 The Richmond Book Art Fair culminates in a day-long fair on Saturday, April 20th, from 10am-5pm featuring artists’ book makers, zine makers, and independent publishers. The theme of the 2019 Richmond Book Art Fair is Power of the Press, highlighting the power of the book, printing and publishing to tell previously untold narratives and highlight marginalized voices in our community. The Richmond Book Art Fair: Power of the Press is made possible by a grant from Virginia Humanities. We will have Blanchard’s Coffee and free demonstrations on bookmaking, letterpress, risography, screen printing, zine making, relief printing and maybe a few more! The schedule will vary daily so come by as much as you’d like!